The Avg. Group Saves 11.1%! Los Angeles Convention Center, STAPLES Center, Microsoft Theater, Grammy Museum at L.A. Live, Regal Cinemas LA Live Stadium 14, Financial, Garment & Jewerly Districts, Disney Concert Hall. 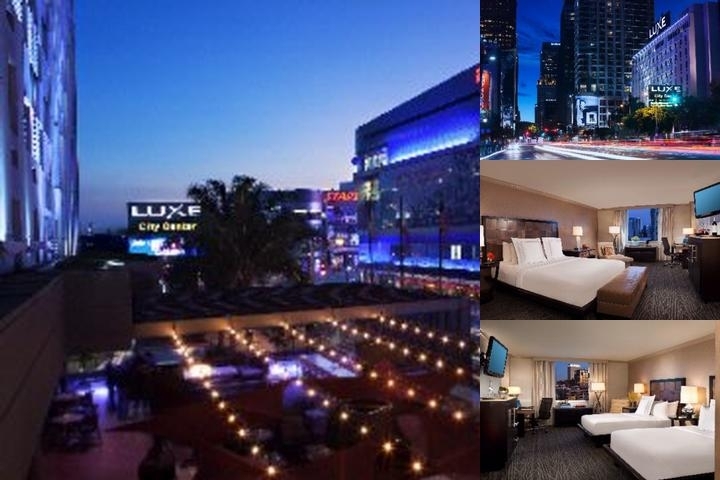 Located in the heart of downtown Los Angeles's financial and cultural district and across the street from the Los Angeles Convention Center,Staples Center, Nokia, and LA Live the hotel offers 195 guestrooms complete with coffee makers, dual phone line, high speed internet access, web TV, dataports and voicemail. Stafford & Mathis features delicious A la carte breakfast that will appeal to any palate. Nixo Patio Lounge features big screen TV and an outdoor patio bar overlooking LA Live, and the downtown skyline. The Hotel also features 5,000 square feet of flexible meeting space, concierge services, Fitness Suite, complimentary WIFI and so much more. Ownership: Jia Yuan USA CO, Inc. Individual cancellations must be made 24 hours before date of arrival; Group cancellations are required 3 weeks prior. $75 pet fee includes dog bed, place mat, water and food bowl, and dog treats. Small dogs only. 105 Fwy East, 110 Fwy North, Exit 9th Street, Right on Flower Street, Right on 11th Street, Right on Figueroa Street. Hotel located on the right hand side on the corner of Olympic and Figueroa. Stafford & Mathis offers a full service dining experience, and items for every Palate. Pricing from $15-25.00. Hotel can also offer room rates inclusive of breakfast. $45.00 per day, inclusive of tax. 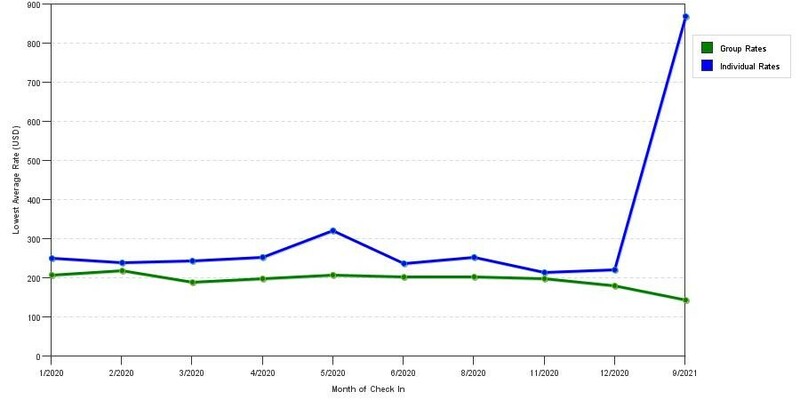 The graph above is averages of room rates for both group rates and the lowest online individual rates our system could find at the time the group/meeting bid was placed. The lowest group rate shown is 41.9% in June 2019 and the highest average individual rate is $351 in the month of June 2019. This chart will show past seasonality and also project future months. If you are flexible with dates, you may want to consider staying at Luxe City Center Hotel in a month when rates are lower. Below are the meeting, banquet, conference and event spaces at Luxe City Center Hotel. Feel free to use the Luxe City Center Hotel meeting space capacities chart below to help in your event planning. Hotel Planner specializes in Downtown Los Angeles event planning for sleeping rooms and meeting space for corporate events, weddings, parties, conventions, negotiated rates and trade shows. 27 x 14 x 0 Ft.
78 x 34 x 0 Ft.
50 x 32 x 0 Ft.
60 x 50 x 0 Ft.